Today, I wanted to mention that Biechow & Pacanow have now been done. The following image (Index page) however, shows the other parishes covered. Perhaps one of these are yours? Then click on the link above and read the book about your parish. It will give you some background on your ancestral parish. Note, the page numbers at the right of the image are about 15 pages less than the image numbers, so add at least 15 to get closer to your parish without a lot of NEXT-NEXT-NEXT sequential scanning. You will notice, that a lot of these parishes have been a part of this blog’s articles. Post your parish’s pastors or send me an email! Well that was some excellent serendipity. I not only got my 2nd-great-grandfather (Marcin Major), but the godmother is my great-grandfather Tomasz’s first wife (Julianna Leszczynska nee Kordos). I also decided that the father, Jozef Leszczynski was the wheelwright (carter) living at the Inn in Piestrzec (aka Piersciec). The Inn owned by his brother (?) Tomasz Leszczynski. So I went and added Jozef Leszczynski & his wife Agnieszka Godowska and their 10 kids to the family tree. As a result of that work, I also found that Jozef later on (1879) owned his own Inn in Szydlow. This is very interesting as it appears that my Leszczynskich were, if not a szlachta/magnate family, at least fairly well off. This confirms other family lore about owning a mill. Last year, Stanczyk noticed that the site metryki.genealodzy.pl had added Stopnica to their collection and in particular, a long list of Alegata for the years 1887-1913. This jester adores alegata for finding echoes of lost genealogical records. So in a case of making your own serendipity, this jester was sequentially scanning all of the above alegata looking for potential relatives, when I noticed a Leszczynski being born in Biechow. That caught my eye. My grandmother, Waleria Leszczynska, was born in Biechow. So I downloaded the two pages of the alegata and the marriage record they went with. It was a goldmine! The years 1849-1874 are lost/missing from Biechow. So when I found an alegata, detailing a birth from 1864, in that lost range, I was ecstatic! Let me provide some context. 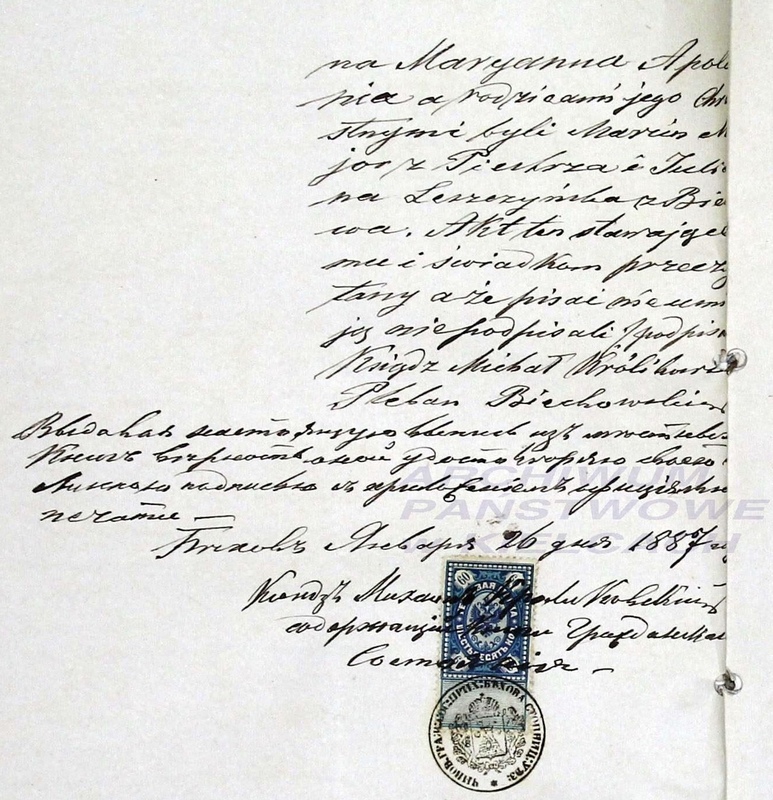 Dateline 1887, Stopnica, a marriage was recorded for Marianna Apolonia Leszczynska, the daughter of Jozef Leszczynska & Agnieszka Godowska. This is a family I have had my eye on, but could not gather enough genealogical proof to say they belong in my family tree, due to the lost records in this region of Russian-Poland. So, since Marianna Apolonia was born in Piestrzec (Biechow parish), she needed an alegata to proof she was able to be married in Stopnica (a nearby parish). So this jester was scanning alegata in Stopnica when her birth popped up. She was born in my grandmother’s parish, Biechow in 1864. Her father, Jozef, was a wheelwright for the Innkeeper in Piestrzec (my great-grandfather Tomasz?). Now I was really interested in that occupation because of the possible tie to my great-grandfather, Tomasz (the Inkeeper). So I examined the birth record from the alegata. On the second page of the alegata, I noticed the godparents and I saw my great-great-grandfather, Marcin Major was the godfather! Ok I now know these Leszczynskich are my family! In fact, Jozef Leszczynski is probably my great-grandfather Tomasz’s brother (less likely a 1st cousin). Did I mention that the Godowskich are an affiliated family? There is enough circumstantial evidence to convince me to add some new relatives from whom I might one day find my 2nd-great-grandparents Leszczynskich. The search goes on, but now I have new clues. Stanczyk is busy with holiday chores, including wishing you, my dear readers a Happy Holidays & a Happy, Healthy New Year too. As most regular readers know, I spend a lot of my time writing about genealogy with a focus on Polish genealogy and in particular in the geographical areas surrounding my paternal grandparent’s ancestral villages (Biechow & Pacanow in old wojewodztwa Kieleckie, now a part of SwietoKrzyskie woj.). Like most areas in and around Eastern /Central Europe the borders change … frequently. So today’s blog article is about 1772 just before the Polish Lithuanian Commonwealth was partitioned amongst the neighboring empires (you know who you are/were, you Black Eagle Empires). It is interesting to note that Pacanow was a much more important regional village in 1772. It was in fact, a deaconate, subordinate to the diocese of Krakow in the Gniezno Wojewodztwa. At that time, there were only two Wojewodztwo (Provinces): Gniezno in the west and Lwow (Lviv, Lemberg, Leopolis, the city of Lions in whatever language) in the east. Any other wojewodztwo were in the Lithuanian portion of the Commonwealth. So the civil/religious hierarchy of the time was: Poland->Gniezno->Krakow->Pacanow, which along with Opatowiec deaconate contained most of the villages this author writes about [you might be tempted to toss in Polaniec and Sandomierz too]. That area is shown in the map at the top. I do a lot of research for my family in the above map, west of Polaniec and south of Pinczow (the lower/left quadrant) in almost every parish north of the Vistula (Wisla) river I have located a record for someone in my family tree — you might say, the bones of Stanczyk’s DNA are rooted here. Biechow & Pacanow (grandparents), Stopnica, Ksziaznice, Zborowek, Swiniary, Olesnica, Szczebrzusz, Beszowa, Opatowiec, Busko and probably another 8-9 other villages with a person here or there. I think Solec too, but I have not found that record yet. I also a few stray, unconnected family records from Szczucin (the only parish south of the Vistula … so far). Are these in your bones too? Drop me a line in the New Year and we can compare family trees. 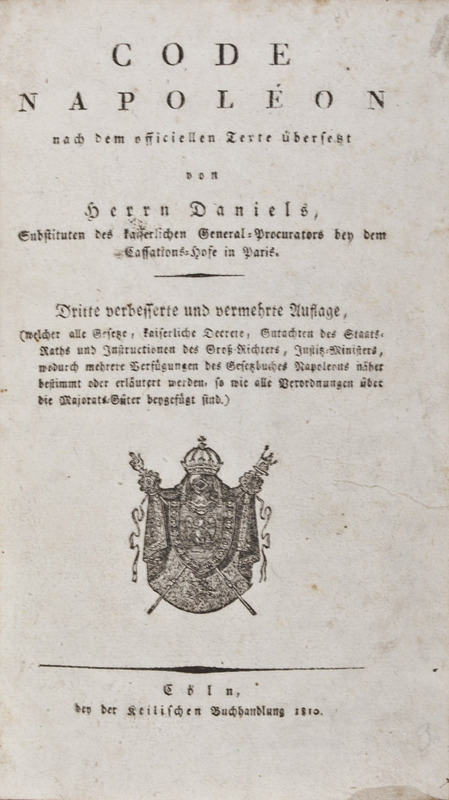 By the way, this research is from the PGSA’s CD-ROM, “The Latin Church in the Polish Commonwealth in 1772” [ISBN – 978-0-924207-12-9 ]. Stanczyk — has a great-grandmother, Aniela Major / Majer who was the daughter or Marcin Major and Katazyna Ozarowicz. I have found some Major in church records. But, as yet I have been unable to locate Ozarowicz records that connect to my family tree. At the top is an image, of the OZAROWICZ (aka Uzarowicz) name as written in Russian/Cyrillic. My Ozarowicz were from Biechow parish (of Stopnica area in the old wojewodztwo Kielce). So today, I am announcing in this blog that I am searching for Ozarowicz from Biechow area. Click on my Stanczyk image and drop me an electronic missive if you are one or know one. Thanks! Stanczyk, long ago realized the value of knowing the terrain of his ancestral villages as an aid in reading and understanding records and in how these data points, just like family names and dates. In fact genealogy is all about “who” did “what” at the “where” on “when”. We are practically journalists. In fact, we collect those four data points (who, what, when, and where) precisely so we can can infer the “why”. Then we write these journalistic facts down in a family tree or a family history, etc. So today’s blog is about where. Two blog posts ago, on May 27th, this jester wrote about PIESZCZOCHOWICZ. I was trying to learn about Boleslaw Pieszczochowicz who along with a Stanley (a brother ?) lived at 3224 Maple Street, Toledo, Lucas County, Ohio. When I examined Boleslaw Piesczochowicz ‘s World War I Draft Registration card, I was rewarded with S?? ?rajowice (or S?? ?rajowiec), Russian Poland. Unfortunately, I could not read the handwriting and, it was a village I was unfamiliar with. So I had made a logical leap. If this PIESZCZOCHOIWCZ was mine then this village would be near my ancestral villages. Keep in mind that this works further back in time when social mobility was a lot less than the present time. So in 1917/1918 this idea is viable. So I went to my Atlas: “Marco Polo POLSKA Atlas Drogowy” [Polish Road Atlas, which is 1:200,000 scale], on page 196. Anything with that scale would work. You do not want it so “zoomed in” [say 1:50,000] that your field of view is too small. Now, as I said, page 196 because, almost every village where I have found records of my family is on that page — hence my idea. 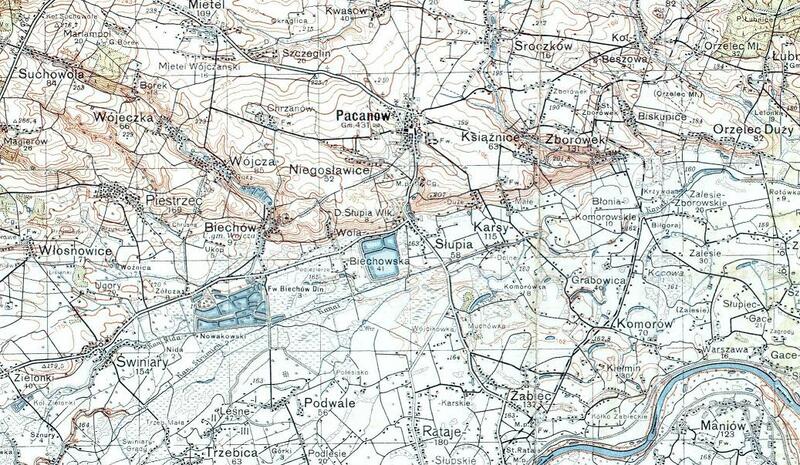 So I scanned that page starting close to Biechow and Stopnica (my locales for Pieszczochowicz). Knowing that Konstanty Pieszczochowicz (the most mobile) also had residences in Strozyska and Chotel Czerwony. Nonetheless, all four of those villages were on page 196. So I scanned all areas around these villages and what do you know? I found SUSKRAJOWIEC. I went back to the WWI Draft document and yes, I could see that was what the clerk was trying to record. Now I had to find what parish it belonged to. The Road Atlas clearly marked the surrounding parishes for me. No surprise, there were more than a handful of possibilities. OK, now it was time to use a Gazetteer that provides the mapping of a locale to its parish. 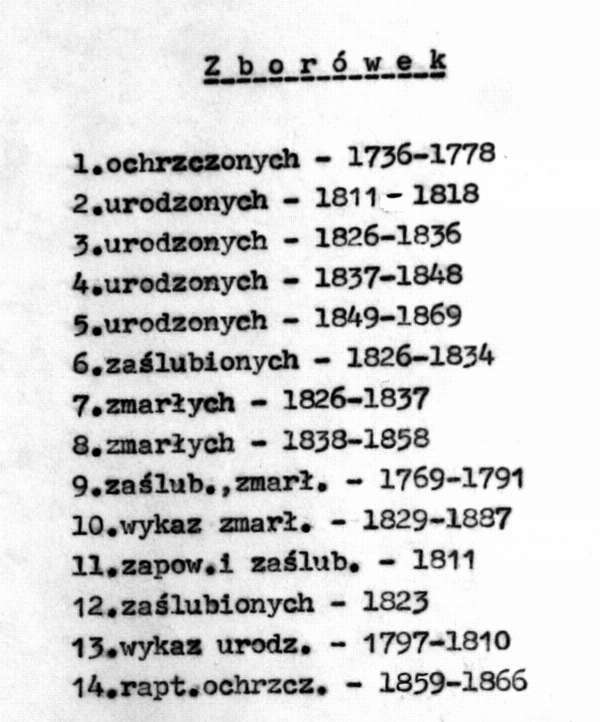 I turned to my trusted source: Skorowidz Miejscowości Rzeczypospolitej Polskiej [Index of Placenames of the Republic of Poland] circa 1931. I looked up ‘Suskrajowice’ and quickly determined that the only Suskrajowice in an area that was previously the Russian Poland partition (and furthermore was in Kielce Gubernia or wojewodztwo) was mapped to a parish named BALICE. OK, now to see if I had any records online for Balice and maybe I could find Boleslaw in his birth year. In fact, when I went to the PRADZIAD database to check what was available, I saw that the Balice parish, I was researching (there were two) only had birth data 1900-1905. So now I went Googling for Balice Mertyki. I found the Balice parish page. Turns out that Balice was erected as a parish only in 1923; early enough to make my Gazetteer, but Boleslaw was born in 1880’s/1890’s so his parish would not have been Balice. The Balice parish page said it was made up from Gnojno and Janina parish territories. OK those were two of the villages I had noted as possibilities for Suskrajowice. Back to the online records: and success both had online records. Now I just had to find which one had Suskrajowice listed in its birth records. I found out that GNOJNO was the one. The year range I needed was not online so I could not verify Boleslaw’s parentage yet. But I know where to look. So if you are seeking Boleslaw Pieszczochowicz (and probably a Stanley/Stanislaw too) then you need to seek in Suskrajowice in: wojewodztwo: Świętokrzyskie (made from Kielce Gubernia), powiat: Kielce, gmina: Chmielnik, parish of GNOJNO (1923 forward in Balice). The takeaway from this article is that a Map and a Gazetteer, along with a little Googling and some PRADZIAD data can get you the ‘WHERE’ with certainty. But you have to have a methodology for the search of parishes. So I detailed my thought process for you to use. Notice also that I used the ‘Russian Poland’ to limit possibilities when you are seeking a village name that frequently occurs in Poland. I also knew the rough area from prior data points and I used these all to understand a poorly handwritten document. I forgot to mention two comments. First, when I find a parish in the Gazetteer, it is very uncommon that the parish was erected after the Great Immigration era that brought our Polish ancestors to the USA. The second comment I should have made, was that I made a 2nd leap when I did not find any Kielce Gubernia metryki online for Balice. I thought the reason for that must be that there was none and that either the parish was new or the data was destroyed (more uncommon than believed to be). Gazetteers – See my Gazetteers page (on right). Stanczyk is working out a rather difficult piece of analysis. 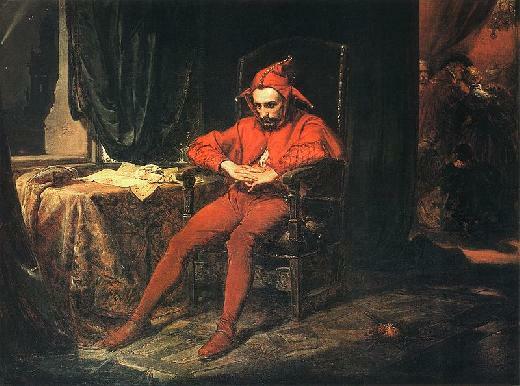 This jester uses Social Network Analysis (#SNA) to assert a familial relationship or connection. It is labor intensive / data intensive process. Prior analyses have been very excellent at predicting valuable lines of research that have led to many further finds. Leon Pieszczochowicz (b. 7-NOV-1865 in Górek, Strożyska, Kielce Gubernia, Poland), son of Konstanty Pieszczochowicz & Maryanna Rzepała. Leon married Jozefa Leszczyńska (b. about 1861 in Biechów, Kielce Gubernia, Poland), daughter of Tomasz Leszczyński & Julianna Kordos. I am sur ethey many children, but I only know of one child: Edward Pieszczochowicz. Now, Edward, comes to the USA from his father Leon in 1910 (who was living in Busko) to his uncle Jan Pieszczochowicz in West Seneca, NJ. Edward, continues onto to Toledo, Lucas County, Ohio. He will move on to Lackawanna, Erie County, NY in later life. But while in Toledo, he becomes the God Father of my own uncle: Stephen Edward Eliasz (son of Joseph Eliasz & Waleriya Leszczynska) at St Anthony’s Church on Nebraska Ave. in Toledo, OH in 1916. Edward Pieszczochowicz’s own God Parents were: Wladyslaw Fras (husband of Agnieszka Leszczynska) & Antonina Leszczyńska (probably nee Sieradzka, married to Jan Leszczyński). So what we see from this one affiliated family is what I considered a very highly connected value to my LESZCZYNSKi research and even so far as to connect my own ELIASZ line as well. We also see the FRAS (aka FRASS) affiliated family and the I believe the SIERADZKI affiliated family. When I first captured Edward Pieszczochowicz at the birth/baptism of my uncle Steve, I had no idea who Edward was and had thought him a family friend [not a family member]. So you see over the span of time the collected data and SNA analysis of other data can connect disparate data points and prove out relativity. Let me end today’s blog article, by returning to the fact that since PIESZCZOCHOWICZ is rather rare, that I am now seeking out Jan Pieszczochowicz and two others: Boleslaw & Stanley Pieszczochowicz (these two also show up in Toledo, OH at 3224 Maple Street). Will this family lead me to my LESZCZYNSKI roots? Time will tell. Yesterday, Stanczyk wrote about Tomasz and I provided an updated timeline of Tomasz Leszczynski throughout much of his 104 year lifespan. Today, I wanted to write a quick post about the affiliated families to the LESZCZYNSKI line. Kordos, Majer/Major, Ozarowicz, Fras/Frass, Sieradzki, Slawinski, Pieszczochowicz/Pierzchowicz, Mikniewicz plus friends — Woloszyn, Stanek, Pawelec, Fortuna and especially MIZDRAK. I mention Mizdrak, because a Jozef Mizdrak, born 5-FEB-1834 in Wojcza, Biechow parish. Seemed to be a part of the LESZCZYNSKI family records from 1860 through the death of Julianna Kordos Leszczynski in Pacanow, 27-NOV-1881 in Biechow parish. 47 years in the Leszczynski records in Poland. Stanczyk is tired, perplexed and satisfied ! If you love genealogy then you probably love the new finds — not just the elation and the happy dance that ensues, but because most new finds also cause new questions that need to be solved or addressed. For years, I have been searching for my LESZCZYNSKI roots (korzenie Leszczynscy). Previously only my friend Jacek from Krakow was able to locate some Leszczynskich in Biechow. He did not tell me his source for these records (no citation) and I have not been able to locate a source for them either — most perplexing. He also left me with, “You might want to look in Stopnica some day.”. That enigmatic quote always lingered with me lo these many years. Now in January, GenBaza.pl came up with AD_KIELCE and AP_KIELCE scans online!!! By Kielce, I mean the former Wojewodztwo / Gubernia (or the regional Archives, both civil and religious). This is where my ancestral villages have all been located (so far). So I took Jacek’s long ago advice and looked in Stopnica for Leszczynskich … But how was I ever to connect the Stopnica LESZCZYNSKICH with my Biechow LESZCZYNSKICH? Well as I was gorging myself with the ELIASZ of Pacanow in GenBaza, I was using GENTEKA as a kind of index into where I should look in GenBaza (which Years, and which Akts #). So I decided to search for Leszczynski using this method and looking at Births/Marriages/Deaths in Stopnica. There were 29 marriages (małżeństwa) in the parish of Stopnica, a parish I knew rather nothing about, much less the town families. But I stopped dead on one marriage. One Leszczynski, Jan Leszczynski, had a mother with a maiden name, Kordosz. Now I knew that my great-grandfather Tomasz married a Julianna Kordos (born in Swiniary). So I became very interested in Małżeństwa (Marriage) Akt #73 in 1881 Stopnica. Mystery solved! When I read the record I found that Jan’s parents were Tomasz & Julianna z. Kordosz[sic] Leszczynskich and the ages were correct. So I had my missing link to Stopnica. I also knew that Falęcin would be a focal point in the Stopnica parish. So I found all of Jan Leszczynski & Antonina Sieradzka ‘s children born in Stopnica. I also found that Jan had a few siblings who also married in Stopnica and between these Stopnica records and a few new ones in Biechow and examining witnesses and God Parents I had the correct set of records and more confirmations of other family knowledge. But I have digressed. This is a blog about my findings from a Genealogical Conference in Salt Lake City — UPGS, 2014. Pelagia Kedzierska‘s birth record, 28-October-1882 in Kroczyce parish. Maciej Wlecial’s birth record, 28-February-1868 in Laszow, Palecznica parish. Tomasz Leszczynski ‘s birth record, 19-December-1829 in Wolica (village, parish, gmina). This jester hit ALL of his major goals. Sure I did not find Jan Leszczynski or Franciszek Leszczynski birth records or Tomasz Leszczynski’s 1st marriage record to Julianna Kordos. But I found Tomasz Leszczynski’s birth record. At least I am 80% sure on Tomasz — I need his marriage record to prove it 100%, but I will now begin to make a case to myself via Social Network Analysis (SNA) whether this is indeed the correct Tomasz or not. It turns out that Tomasz’s (20-December-1829) was a twin (Szczepan his twin). I also knew Tomasz’s parents were: Jan Leszczynski, age 30 (-> born about 1799) and Anna Owczarczyk age 29 (-> born about 1800). I also knew the names of the witnesses and the God Parents too. One God Parent made me take note: Tekla Slawinska. It turns out the Anna had a very rare name: OWCZARCZYK. So I was able to find her marriage record to Jan Leszczynski … in DZIERAZNIA (a nearby parish to Wolica, with many cross marriages). So now I had a fourth major find in my 2x-great-grandparent’s marriage record 19-JULY-1825 in Dzieraznia parish (village/gmina/powiat) of Szysczya. So now I had the names of yet another generation: Antoni & Katarzyna Leszczynskich. Now I have my 2nd & 3rd great-grandparents in the Leszczynski line. I also had two more parishes: Wolica & Dzieraznia! A great adventure to be sure. I had many other finds that were not so as notable. I had success in my Croatian VESPEKs line too. Also a minor confirmation of my wife’s paternal grandmother’s village: Kovesliget (Maramaros region) of Austria-Hungarian (aka Hapsburg) Empire. Kovesliget is now in modern day Romania. The creme-de-la-creme … doing the research while surrounded by my Polish Genealogy friends at UPGS 2014. Priceless! Stanczyk, prepares for going to an archive or research library. So when I was awarded the prize of going to #RootsTech, I immediately started my preparations. I favor the microfilm which are free to read in the Family History Library in Salt Lake City. And those were just the Polish villages (there were many more in the USA, but that is another floor). Some of the above are because I am expanding the search for records to surrounding parishes. That is called a proximity/circle search. As it turned out, the proximity also included nearby parishes where affiliated families said they were from. So I was looking for GAWLIK in Opatowiec and GRONEK in Stopnica/Olesnica. I always checked for ELIJASZ/LESZCZYŃSKI/WLECIAŁOWSKI in all villages. I was disappointed that I did not find KĘDZIERSKI in Tumlin. 943.8 E7sh (Malopolska cadastral. This was a high priority, so it was disappointing not to be able to locate these). 943.84 R2e (a register of Landowners — also not locatable). A couple of books I did find, were a disappointment because they did not contain any of my family. C‘est la vie — that too is a part of the research. All told I had 10 spreadsheet pages of Family History Catatlog Items! That may seem like a lot; But it is always better to be over prepared because as you see some items cannot be located, some are dead-ends, and some quickly show they do not contain what you are looking for after all. Being under prepared is just a time waster, but they do have PCs available to do catalog look-ups — so it is not a show stopper. I dutifully check them off, as I use them and some times I note my findings (or lack there of). Next time I will have to search more thoroughly through Beszowa and exhaustively too [for Paluch]. I will also search Dobrowoda parish too [for Major]. I will have to dedicate a lot of time to Swinary too [for Elijasz, Leszczynski, Kordos, etc.] and also Szczucin. I will have to find a way to get to Buffalo and find my great-uncle Franciszek Leszczynski’s records and hopefully his brother Jan (aka John) Leszczynski too. I of course need to get to Poland and visit the actual archives and parishes of my ancestors to see those records that have not yet been microfilmed — I need to write down this research plan. I already know where the civil and diocesan archives are and of course the parishes themselves. I will need an abundance of time there to get around the language and customs and the learning curve of using these resources. How do you prepare for your genealogy trips? 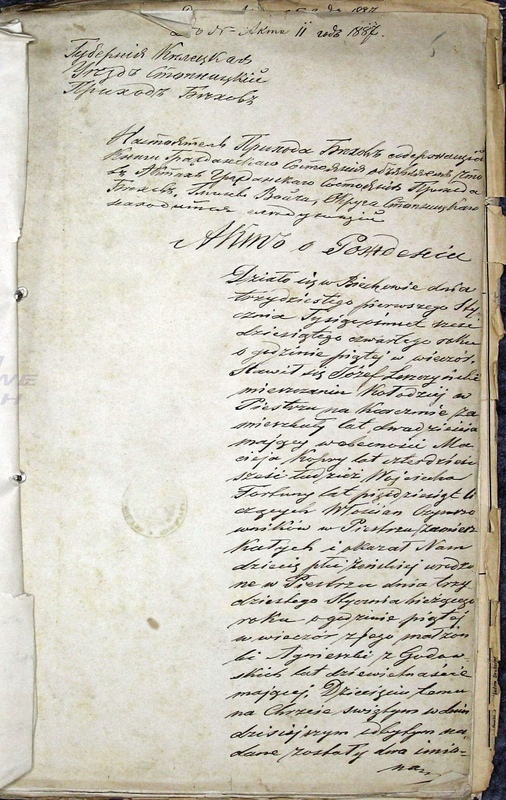 I am continuing my efforts to retrieve/extract the Jewish records from the Catholic parish of Biechow (an homage to moja dobra żona, Tereza) during the years when the Catholic Church was ordered to act the civil registration authority for all parties/religions. My previous postings were for the years 1810-1820 inclusive. 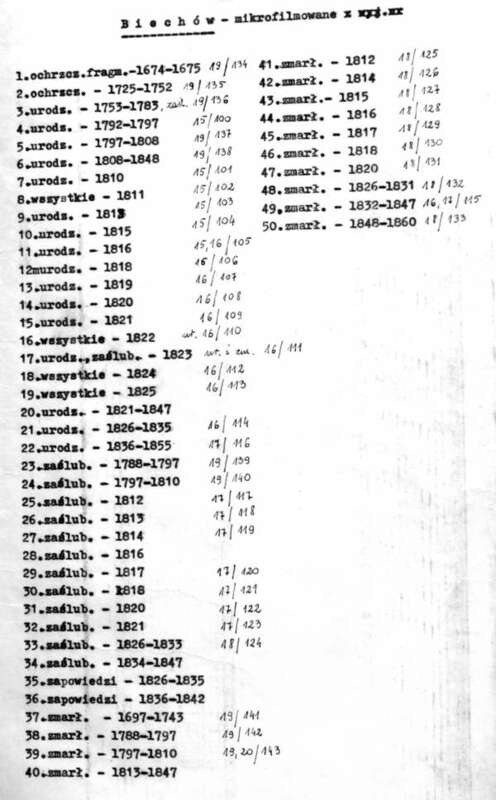 These are the Jewish Births and even the Death records too from 1821 recorded in Biechow parish. Ergo, this posting brings us upto: 1810-1821 inclusive. The prior post is here . As per usual, I give permission for all Jewish data that I have been posting to be included in the JRI project. Happy New Year 5772 [upcoming this week]. In 1821, there were three Jewish births out of a total of 112 births recorded in the Biechow parish. That works out to be 2.7% of the total. There were no indexes for Marriage or Death. There were 57 death records total and five deaths were Jewish residents. That works out to be 8.8% of the total. 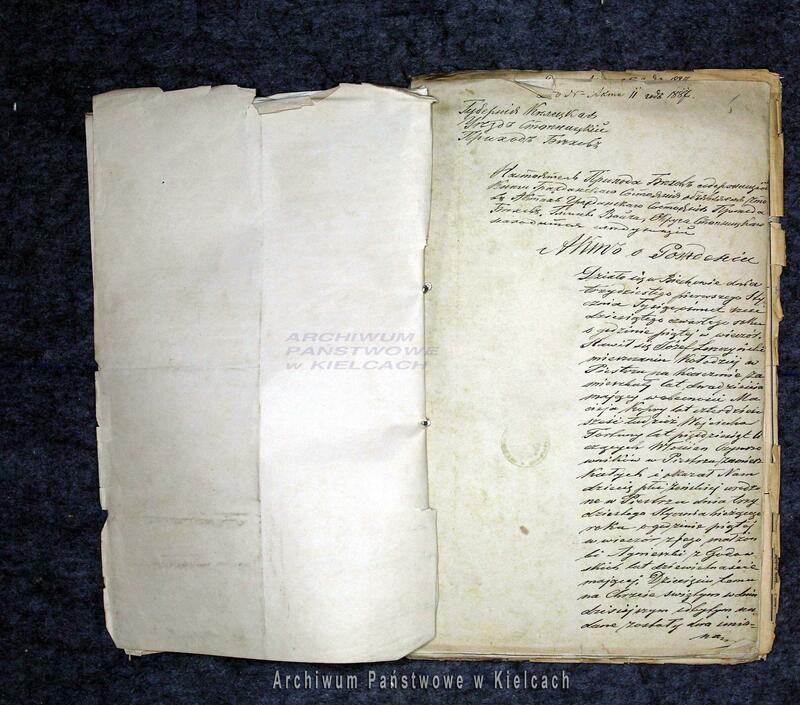 I am continuing my efforts to retrieve/extract the Jewish records from the Catholic parish of Biechow during the years when the Catholic Church was ordered to act the civil registration authority. My previous postings were for the years 1810-1818. inclusive. These are the Jewish Births from 1819 recorded in Biechow parish. Ergo, this posting brings us upto: 1810-1819 inclusive. The prior post is here . Before I begin, I have been watching the evolution of names in the church register and I thought I would offer a few observations. First off, I am a gentile genealogist. So my treatment of Jewish names as rendered in the Polish language with its complex grammar is suspect — but I am learning. So earlier I have been struggling with the surname: Golbarka or Goberka (also rendered as Golbarkow). First off, the assumption of ‘bark’ vs ‘berk’ due to poor writing and page condition is definitely off. I now know the name is Golberg (or we would probably render in 20th century English as Goldberg/Goldburg). I think I will keep the Golberkow ending as this is the grammatical construct for referring to the family as when writing the woman’s maiden name. Notice I have decided to drop the ending ‘a’ on men’s names — which I am also thinking I should do on many first names as well, but my lack of experience with Jewish names of the 19th century Poland causes me to wonder how to apply what William Hoffman calls, ‘The Chopping Block’ to both first and last names when Jewish. So forgive me when I write: Moska, Mendla and Herszla(which in 20th century America I’d write as Herschel as in Herschel Walker). I know I need to drop the ending ‘a’, but I am not certain as to how to write those names, so I leave them as I find them for someone more expert than I to correct. My apologies in advance. We see three births out of 104 total births. That represents a population of about 2.88% of the total parish population. So we are in the range of 3% +/- 0.25% which seems to be what I have seen in previous years. Again realize I am trying to give an in idea of the Jewish population in proportion to the entire population of the parish in (not intimating that the Jewish peoples are participants in the church parish activities). The 3% represents a modest growth from the 2.6% in Biechow census from 1787. [See Parish Census at the top of this blog]. According to that same census, the entire set of parishes in the surrounding area was about 6.4% Jewish. My reason for doing this assessment is to convince the JRI, that it should at some point visit all Catholic parishes to pull out the remaining Jewish people without looking at the amount of effort required to yeild such tiny results. We know they are there — do not leave them behind. After my Social Network Analysis, I am thinking that these non-shtetl Jews are a kind of glue between the surrounding towns/shtetls. The assessment also shows that Jews and Catholics lived side by side and not segregated [in this very rural area very near to the Austria-Poland partition]. Now this may only be true in Poland and not the rest of “The Pale of Settlement” as defined by the Czars of the Russian Empire. According to Wikipedia, Jews (of the Pale) were not forbidden by the Czars from rural areas until 1882. 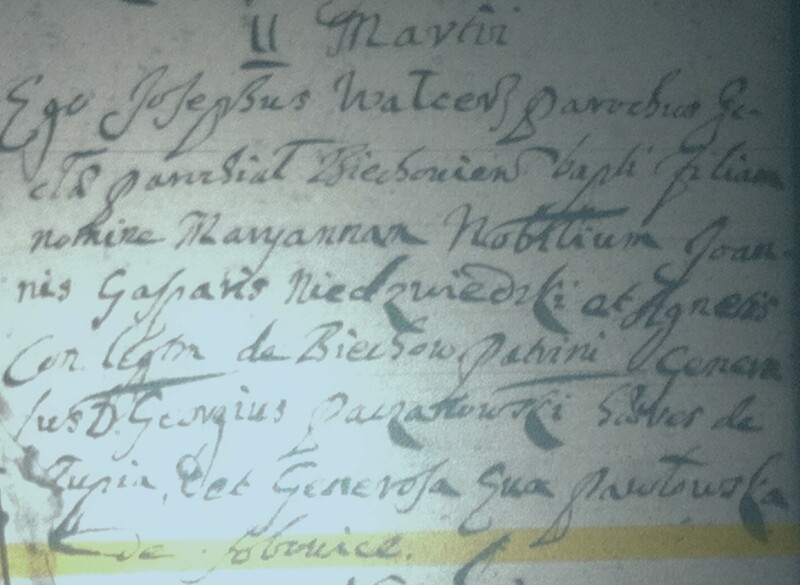 Stanczyk has been trying to find someone to help him confirm that MAJOR (pronounced by my family in USA as My-Her and misspelled in USA as Meyer) was the Russification of the Biechow family name that has been in Biechow at least since the 1670’s (as far as the record goes back) of Maicher/Maycher/Majcher. In fact the Maicherowich have married the Eliaszow for many years. Now I have a good friend Jasek of Krakow (a native Pole) who has helped me with my genealogical research (since we both have family from the same ancestral villages). I first proposed to that ELIASZ = HELIASZ = ELIJASZ and after some time and mutual research he agreed with me. I said that ELIJASZ was just the Russification of ELIASZ due to Russian/Cyrillic transliteration. As I said, Jasek accepted my findings and blessed what he called this name “evolution”. So when I proposed that MAJOR=MAICHER/MAJCHER/MAYCHER and gave my reasons (i.e. no MAJOR before Russian Partition and no MAICHER after the Russian Partition, etc.). I was taken back by my friends, “Perhaps”. If it is one thing I knew about the very polite Poles, is that they will not say you are wrong — unless they know you very well. So instead of a “I don’t think so” or an outright, “I believe you are wrong”, Jasek said, “Perhaps” in an unconvincing fashion that crushed my hopes. So today as I was looking at microfilm images verifying the Priest names, I was looking at Biechow parish Marriage Record #4 from 1880. I was interested because, I saw the groom’s name was MAJOR and I thought perhaps he was a brother to my great-grandmother (Aniela Major Leszczynska). So I looked at the record closely to see who the parents of JAKOB MAJOR were. Now when I did, I got excited, because I found the mom was Sofia Heliasz (always good to find those female relatives and their married names). I then noticed that the groom’s father was Antoni MAJOR. I then tried to find a Sophia/Zofia Eliasz/Heliasz in my family tree in the appropriate era and see if I had one that married a Maicher. Lo and Behold, I had my long sought after proof. I had a Zofia Eliasz married to Antoni Maicher and that they were born about 1814. So when I saw that their Jakob was age 39 in 1880 (implying birth about 1841, when the parents would have been about 27) and I saw that he was born in Piestrzec, the same village where the parents were married, his birth of 1841 is after the 1832 marriage date of the parents. I knew I had a match. Not only did I have MAJOR=MAYCHER, I also had a bonus of HELIASZ=ELIASZ [long since convinced of this]. Now this was significant as I had my first proof across the Russian language boundary to the pre-1868 Polish language days. A few times before, I have spoken about the Codex Napoleon. Why does Stanczyk speak of Napoleon? Well, he (or his army) did discover the Rosetta Stone, leading to the understanding of Hieroglyphics and also while he was in Egypt he also uncovered the Sphinx which had lain buried in sand for centuries. He commissioned the Arc de Triomphe too. His military exploits reshaped the European borders. Finally, his progressive laws embodied in the corpus: Codex Napoleon gave personal and property rights to the individual and abolished feudalism. But did you know those codes in the Kodexu Napoleon (see Polish does have the letter ‘x’, at least for foreign words), also designated how to record vital records? Most European Church Records after 1806 followed this format and it was this code that required the two witnesses in vital records. The image at left/above is from Biechow parish church book in 1811, noting (above the yellow line) that they now follow the Kodexu Napoleon –Biechow now a part of the Grand Duchy of Warsaw. From LDS MF # 936660, it appears to me that starting with August 15th, 1810 the vital records in the Catholic Church in the parish of Biechow switched to the “Napoleonic Form” — a long paragraph narrative in a standard form, with two witnesses, written in the local language (Polish, not Latin). This blog’s meme is really about how History/Law shape the discipline of genealogical research. I am not merely thinking about border changes — although that is certainly a part of this meme. Today’s thread in the meme is certainly about the border changes and the shifting administrative units (Departement vs Wojewodztwo vs Gubernia, etc. ), but also the data changes required by the law. For instance, the requirement for two witnesses means we have two more names in the record for our research. One of the witnesses may also be a God Parent or possibly just another family member. Does that indicate a new relationship (i.e. another sibling)? Perhaps a witness or declarant is a mid-wife. Does that indicate an illegitimate birth or that the father is away, serving in the military? More data, means more information or clues/mysteries for further research. Prior to Napoleon and the Codex that bears his name, we did not have this information, afterwards we do. Napoleon was beneficial to genealogical research — who knew? Moja żona (my wife) Tereza is a very good wife indeed. So I wished to honor her by doing some research for the Jewish faithful. I suppose many genealogists are unaware that much of Europe owes its church records and their format to the Codex Napoleon. Another side effect of this edict was to create a new civil registry of civil records, which Napoleon originally placed responsibility with the Catholic church. So peoples of all faiths had to register with the Catholic church for the years 1810-1830 [approximately] until civil data could be collected by all faiths in their own church/temple/synagogue. So whilst I was collecting other genealogical research data, I decided to pay extra attention to the Jewish births listed to honor my wife. I am sure this was an onerous requirement for Jewish citizens to have to record their vital records with the Catholic church. This village of my ancestors has NOT been indexed by JRI, as there was no significant Jewish presence in these villages, but there were Jews indeed! So what was probably an imposition for Jews may now be a blessing and a mitzvah for me (and my wife). Why a blessing? So many Jewish records were destroyed during World War II (and possibly in other pogroms) that any echo, any echo at all of those who were here is a blessing. #62 Wolf, Sura (baby); Jasek Wolf (father); Blima Haymnowiczow (mother). Well I guess you can see why JRI ignored LDS Microfilm #936660. Out of 341 births only seven (just 2%) were Jewish births. Jewish genealogists, feel free to collect this data and add it to your database. These records are in Polish in this era.